Atopic dermatitis commonly manifests itself in infants with dry and scaly patches appearing on the skin. These patches are often intensely itchy.6 The symptoms of atopic dermatitis can vary, depending on the age of the person with the condition. 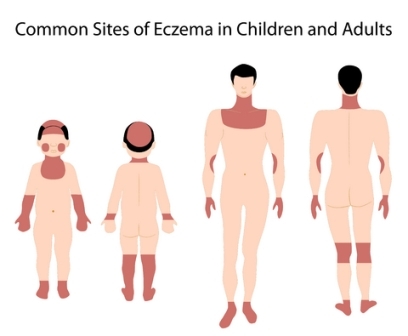 Most people develop atopic dermatitis before the age of 5.6 Half of people who develop the condition in childhood continue to have symptoms of it as an adult, though these symptoms are often different to those experienced by children. Rashes can cause extreme itchiness, which may lead to trouble sleeping. Continuous rubbing and scratching can lead to skin infections. Also common on neck, wrists, ankles, crease between buttock and legs. Rashes can thicken (also known as lichenification) and then develop knots and a permanent itch. Rashes can lead to skin infections. Adults who developed atopic dermatitis as a child but no longer experience the condition, can still experience dry or easily irritated skin, hand eczema and eye problems. The appearance of skin affected by atopic dermatitis will depend on how much a person scratches and whether the skin is infected. Scratching and rubbing irritates the skin further, increases inflammation and makes itchiness worse.